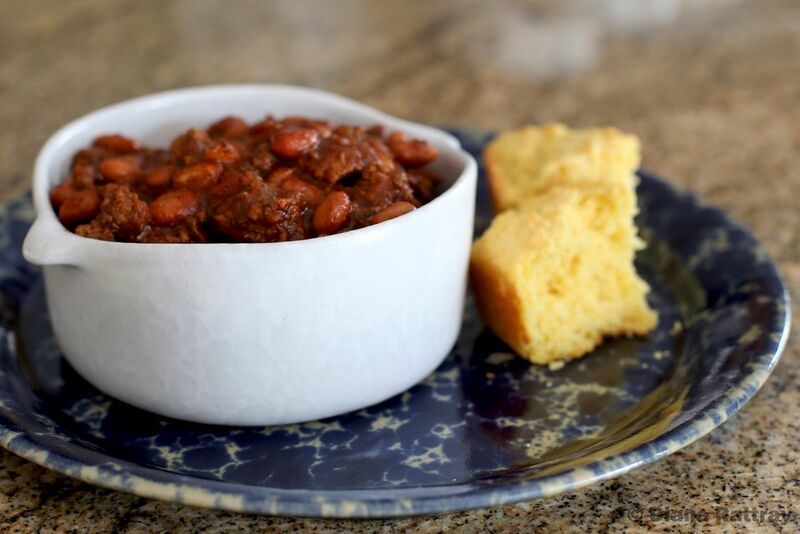 This flavorful slow cooker chili recipe contains dried pinto beans, ground beef, chili powder, and a variety of seasonings. Plan to soak the beans overnight or follow the quick soak directions on the package of beans. The recipe is made from scratch with dried pinto beans or small red beans. You could also use kidney beans or great northern beans if you prefer them. These chili beans are versatile and could be made with the addition of other vegetables. The recipe is also easily doubled. Pick the beans over and discard any malformed or damaged beans. Look for any small stones. Rinse the beans and put in a medium saucepan. Cover with cold water (to a depth of about 3 to 4 inches over the beans) and soak for 6 hours or overnight. Drain the beans and rinse. Put them back in the saucepan and cover with 3 to 4 inches of water. Bring the beans to a boil over medium heat and cook for about 1 to 2 hours, or until tender. Drain and transfer the beans to the crock pot. In a large skillet over medium heat, brown the ground beef with the onion. Add the browned beef and onions, plus the tomato paste, soup, water, chili powder, salt, garlic powder, and sugar to the slow cooker. Stir to thoroughly blend ingredients. Cover and cook on LOW for 5 to 7 hours or on HIGH for about 3 hours. Check about halfway through the cooking time and add more water if necessary. Serve the chili in a bowl topped with cheese, sour cream, green onions, and hot sauce and enjoy! If you have no trouble with beans becoming tender in the slow cooker, there should be no need to cook them first (step 6). Put them right in the crock pot after soaking and add the remaining ingredients. Use two (15-ounce) cans of drained pinto or small red beans instead of dried beans. Add shredded or julienned carrots to the skillet with the ground beef and onion. If desired, add some fresh chopped green or red sweet bell pepper as well. Add one (14 1/2-ounce) can of diced tomatoes or zesty chili-style tomatoes along with the tomato paste. Add a 4-ounce can of chopped mild green chile peppers to the slow cooker along with the soup.